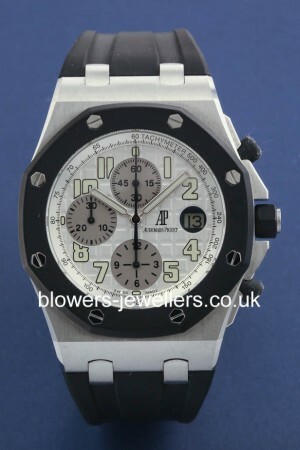 Audemars Piguet Royal Oak Offshore 25940SK.OO.D002CA.02.A. Steel case diameter 41mm which is water resistant to 100 meters. Automatic chronometer chronograph AP movement with 21K rotor, 42 hour autonomy, rhodium plated movement with Cotes de Geneve and circular decorative patterns. Brushed and polished steel case with composite rubber bezel, eight hexagonal recessed nuts, fastening the eight screw throughs of the case back. Silver dial with large Tapisserie pattern, silvered sub-dials, luminous Arabic numerals. Rubber strap with AP folding clasp. Box and papers. Our reference S21867. SKU: 3026270. Categories: Audemars Piguet, Royal Oak Offshore.